How to communicate effectively at work and get your point across. ​Help make meetings and presentations more productive by following these tips to ensure you communicate effectively at work. Have you ever sat through a presentation and, at the end, wondered what the point of it was and what the speaker was trying to say? I am sure I am not the only person who has sat in a meeting wondering why someone was still talking as they didn’t seem to be making a valuable contribution to the discussion. When I reflect back on these meetings and presentations, I find myself wondering if I have had that impact on others and thinking how I can ensure that is never the case! These kinds of meetings and presentations can be very frustrating and leave you feeling you have wasted that most precious commodity – time. So what can you do to make sure you are not the person people just want to stop talking, that you are heard, and that your contributions to meetings and your presentations add real value? How can you communicate effectively at work? Try answering these four questions in sequence as you get ready to deliver a focused and impactful message. Question 1. What do you want people to do as a result of your input? The point of all communication is for people to take action. Those actions could range from making a decision based on all the facts, changing something, agreeing to a proposal, learning something or thinking differently about it, doing something or anything in between. If you know the outcome you want from your communication, it will be much easier for your audience to understand this and, therefore, make it more likely to happen. Question 2. What do the people you are speaking to know about this now? Question 3: What do they need to know in order to take the necessary action? When we are in a meeting or giving a presentation, it can be very tempting to tell people everything we know about a subject – especially if it is something we are passionate about or which we are an expert on. 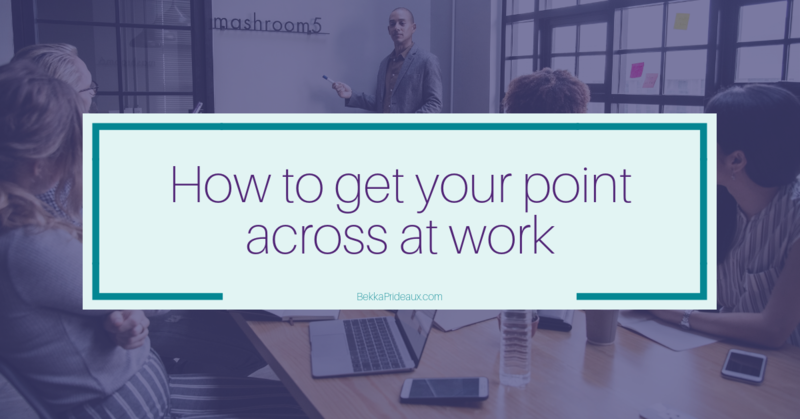 However, to communicate effectively at work, finding the balance between dispensing just enough facts and sharing your complete works on the subject is critical in being impactful. Question 4: What is the best way to sequence the information that you are going to share? We grow up listening to stories and learning from them so now is the time to put those lessons into action. As you put your contribution or presentation together, think about your listeners’ journey from where they are now (your answer to Question 2) to the actions they need to take (your answer to Question 1). To have the highest impact, you are looking for the most direct route. The amount of time you spend answering each question and the rigour with which you answer before you start your communication will vary according to circumstances. Obviously in a meeting you won’t have much time, but regular use of these questions – as well as checking with yourself as meetings progress – will make a significant difference to your impact in those meetings. Before a presentation you should have time to spend longer on the questions; this will ensure you are best prepared, help you engage your audience effectively and achieve the desired outcomes. As you get ready for your next presentation and as you go into your next meeting, I encourage you to consider these four questions. They will help you be heard and get your point across quickly and with maximum impact. The more you practise using these questions, the quicker and more instinctive they will become; soon you really will be able to communicate effectively at work. Being able to communicate effectively at work will help Set You Up for Success. Book a consult call with Bekka to find out how working with a coach who specialises in building your skills while you deliver in your role can accelerate both your development and your performance.